In a telling sign of the times for the TV industry, many of the night's big winners came from streaming platforms. HBO's "Game of Thrones" and Amazon's "The Marvelous Mrs. Maisel" won top honors at the 70th Emmy Awards on Monday night, capping off a ceremony that featured pointed barbs about Hollywood diversity, nods to the #MeToo movement, and one-liners about the rise of streaming platforms. "Thrones," a brutal fantasy epic, fended off challenges from Netflix's "The Crown," a decades-spanning chronicle of the British royal family, and Hulu's "The Handmaid's Tale," a grim vision of a dystopian future that won the best drama prize last year. But the champion of the ceremony might have been "Mrs. Maisel," a bubbly comedy that follows a 1950s housewife who breaks into stand-up comedy. "Mrs. Maisel" also scooped up honors for its lead actress (Rachel Brosnahan), supporting actress (Alex Borstein), directing (Amy Sherman-Palladino, who co-created the series) and writing (Sherman-Palladino again). "It's about a woman who's finding her voice anew, and it's one of the things that's happening all over the county right now," Brosnahan said of the show in her acceptance speech. She called on the audience and viewers to vote in the upcoming midterm elections. In a telling sign of the times for the TV industry, many of the night's big winners came from Amazon Prime Video and Netflix, two leading streaming services that have challenged the long-standing dominance of traditional broadcast and cable networks. The premium cable channel HBO was not to be forgotten, though, racking up close to two dozen prizes, including multiple wins for "Thrones" and "Barry," a dark comedy starring "SNL" alum Bill Hader as a hitman who moonlights as an aspiring actor. 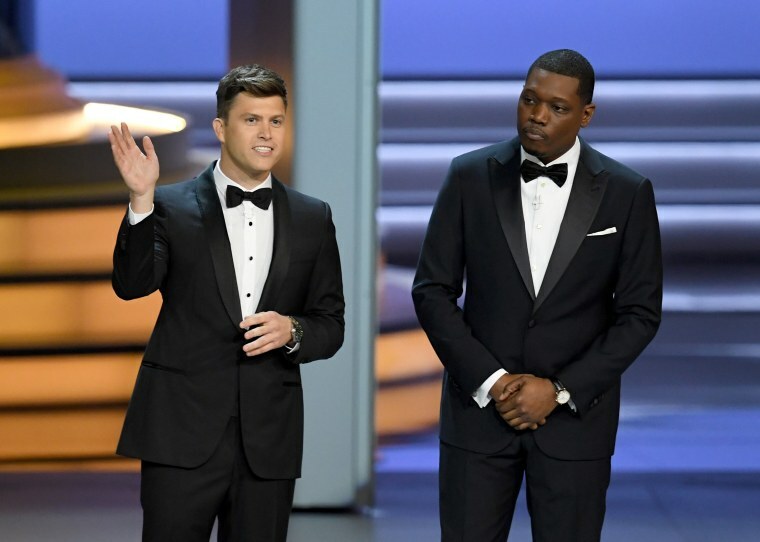 The co-hosts, "Saturday Night Live" players Michael Che and Colin Jost, set the tone at the start of the night with a monologue that blended riffs on the national political scene with caustic quips about the sexual misconduct scandals that have roiled the entertainment industry. "It is an honor to be sharing this night with the many, many talented and creative people who haven't been caught," said Che, who co-hosts the "Weekend Update" segment with Jost on "SNL." Che and Jost may have been upstaged, however, by a troupe of performers, including fellow "SNL" cast members Kate McKinnon and KenanThompson, who opened the telecast with a parody song that took aim at racial inclusivity and representation on TV — or the lack thereof. The top acting awards went to Claire Foy (lead drama actress, "The Crown"), Matthew Rhys (lead drama actor, "The Americans"), Brosnahan and Hader. Foy and Rhys nabbed last-chance honors: Foy's role as a young Queen Elizabeth II will soon go to another actress and "The Americans" wrapped its sixth and final season in May. "This wasn't supposed to happen," Foy said in her acceptance speech, presumably referring to the high expectations for Oh. In the supporting categories, Thandie Newton won for her turn as an android on HBO's "Westworld"; Peter Dinklage nabbed a third Emmy for his role as the hard-drinking, quick-thinking Tyrion Lannister on "Thrones"; and Henry Winkler (also known as "The Fonz" on "Happy Days) took home his first Emmy for playing a mercurial acting coach on "Barry." "The Assassination of Gianni Versace: American Crime Story," an unsettling docudrama from the mind of TV impresario Ryan Murphy, walked away with multiple wins: best limited series, best actor in a limited series (Darren Criss) and best directing for a limited series (Murphy). In one of the most memorable moments of the telecast, an honoree treated his girlfriend — and a live television audience — to a surprise proposal. Glenn Weiss, who won for directing this year's Oscars telecast, began his speech by saying that his mother died two weeks ago, adding that she always liked his girlfriend, who he identified as Jan. He then said: "You wonder why I don't want to call you my girlfriend? It's because I want to call you my wife." Jan rushed to the scene and the clearly overjoyed audience rose to its feet. She said yes, and Weiss put his late mother's ring on her ringer.